When I opened Rusty Gates' book on Michigan's Au Sable River it was like opening a window on my past. My association with Michigan's Au Sable River goes back nearly fifty years. 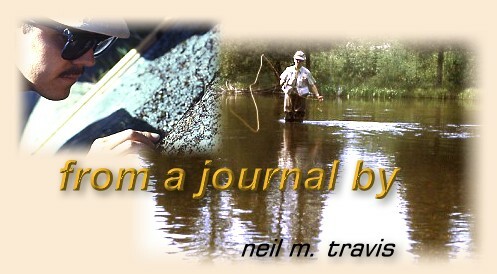 On the Mason Tract I began a fly-fishing odyssey that continues to this day. It was at Canoe Harbor on the South Branch that JC and I first became acquainted, it was at Keystone Landing on the Holy Water that I first met the Lady Fisher, and it was at that same spot that I was the best man at their wedding. The Au Sable River holds a special place in my heart, and holds memories that are among my most precious. Rusty Gates, the owner of Gates Au Sable Lodge, on the Au Sable River near Grayling, Michigan is the compiler and author of this new book. The Au Sable River is a classic trout stream in the middle of Michigan's lower peninsula, and wends its way across the pine barren country to mingle with the waters of Lake Huron. In its upper reaches two major tributaries, the south and the north branch join the main stream, each of them are legendary trout streams in their own right. Rusty and friends provide some insight into each of these waters. 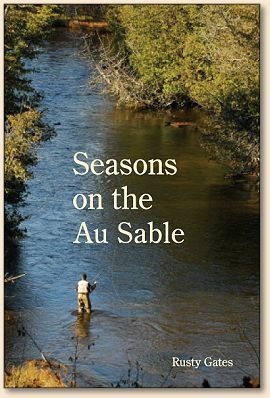 A person familiar with the Au Sable will find this book a trip down memory lane. Recognizable places tumble off the pages from Canoe Harbor on the South Branch to the Holy Water stretches on the Main Stream, and the thin water of the North Branch. Stories of night fishing will bring back a flood of memories to anyone who has spent any time on this classic stream. I tried to decide exactly what purpose this book fills on an angler's bookshelf. It is not a 'how to' book, although there are some descriptions of flies and techniques sprinkled throughout the pages. Unlike Hazen Miller's classic book, The Old Au Sable, it is not a history of the river, although there are some historical references. The various entries appear to be taken from the pages of an angler's diary, but in this case I suspect that many of them were taken from the daily on-line fishing report.